The Raging Bull vs. The Italian Stallion. Better late than never? A pair of aging boxing rivals are coaxed out of retirement to fight one final bout . . . 30 years after their last match. Two of the greatest boxing movie icons finally come face to face. In the red corner, two-time Oscar winner and mafia kingpin Robert “Jake La Motta” De Niro. In the blue corner, two-time Oscar nominee and action movie macho man, Sylvester “Rocky Balboa” Stallone. Did we get a tense ten round punch up? Or was it another hyped up dud with a shoddy KO in the first round? LET’S GET READDDDDYYYY TO REVIEEWWWWW. Watchable if a little disappointing. De Niro and Stallone made a frankly dull, predictable and by the book boxing dramedy a lot more entertaining than it should have been. The opening sequence (delivered in a flashy sports feed) quickly established the pair’s rivalry. The CGI and make up actually made the leading men look like they did in the 70s. The quick 30 second boxing skits were quite convincing. We watch Henry “Razor” Sharp (the not so sharp Stallone) battling it with his greatest nemesis, Billy “The Kid” McDonnen (De Niro), both one a piece in their victories, with one final grudge match on the cards. BUT out of nowhere, Razor retires. 30 years later and Razor (a hench looking Stallone) is still happy to forget and work at the local steel mill. While Kid (an overweight De Niro) is still living off the fame BUT unhappy about the match that never was. He may still be a unit BUT Stallone hasn’t aged well. However, he delivered some of the best acting I’ve seen him do in some time. While De Niro played the arrogant Billy with aplomb. An unexpected reunion at a video game commercial shoot set fists flying between the retired boxers. It was hilarious watching the pair flail about like two wrinkly Buzz Lightyears in those ridiculous green suits. Inevitably, the spat goes viral and the grudge match is very much back on. De Niro and Stallone sparred well off each other. The insults and jibes were snappy and quick witted. It wasn’t long before we discover the real reason behind their rivalry. What could possibly put two men against each other? Bingo, a woman. In the form of the lovely Kim Basinger, who still ain’t looking too bad. What? She had good chemistry with Stallone and made the cliched cheesy romance subplot a little more bearable. The grudge match opened opportunities for the old codgers. For the Kid? A chance to appease his ego. For the Razor? Money to help take care of his old trainer. The scene stealing Alan Arkin (Little Miss Sunshine). And once Kevin Hart was thrown into the mix, the lumbering pace picked up. I never thought Arkin and Hart would make such an entertaining duo. For all the negative press, I expected something worse. 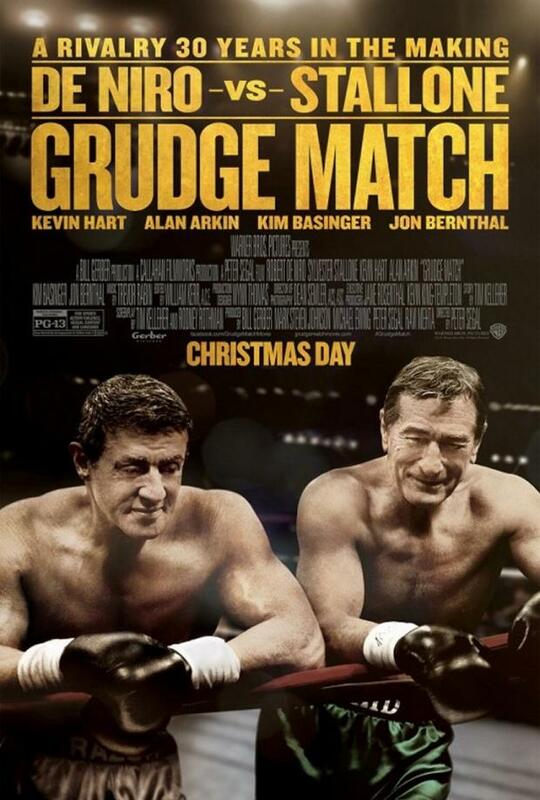 Grudge Match was hardly original. The pace was patchy and the cliched schmaltzy guff was a little predictable BUT it was still easygoing enough and delivered the odd chuckle. Stallone’s training montage was brilliant. A perfect Rocky parody by the man himself. Struggling to drink eggs and wondering why the hell he’s punching meat in a freezer. The fight scenes weren’t bad BUT I was left wanting by the finale. It was all build up with some promising sequences as the old boys gave it a good ol’ go. BUT it was rushed and quick cut. Whether that was to make up for the ailing actors? I’m not sure. Shame. The tone was all over the pace. The video game scrap. Good. Fighting while skydiving? OTT and stupid. The subplot involving Billy’s newly discovered son (Jon Bernthal – The Walking Dead) was wafer thin and dreadfully cliched. A mixed bag. Easygoing enough BUT if you were expecting Motta v Balboa, you’ll be left disappointed but give ’em a break. They do their best with the material. It’s just a shame that the material was a little weak. For the boxing nuts, hang on for the credits if you want to see a proper boxing rivalry revisited. Reblogged this on MAD MOVIE RANTER/THAT MOVIE WRITER GUY.